Industrial Policy & Promotion has to take the approval of Cabinet. 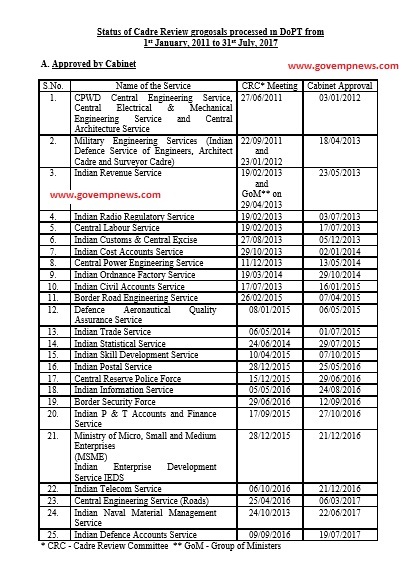 Central Industrial Security Force (CISF) Approval of MoS (PP) and FM have been obtained on the recommendations of CRC. MHA has to take the approval of Cabinet. 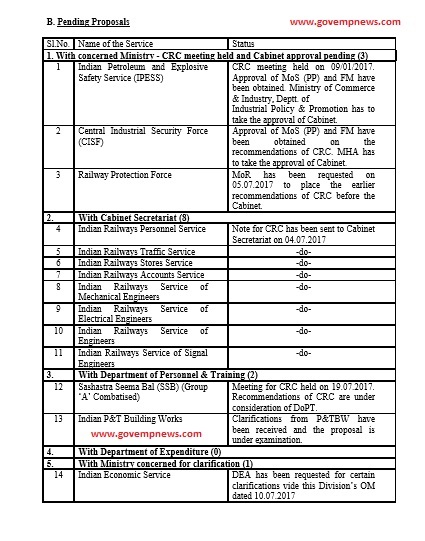 Railway Protection Force MoR has been requested on 05.07.2017 to place the earlier recommendations of CRC before the Cabinet. Sashastra Seema Bal (SSB) (Group ‘A’ Combatised) Meeting for CRC held on 19.07.2017. Recommendations of CRC are under consideration of DoPT. Indian P&T Building Works Clarifications from P&TBW have been received and the proposal is under examination.